Iodoral® contains a mixture (total 12.5mg iodine) consisting of 5 mg iodine and 7.5 mg iodide. 90 tablets per bottle. Please talk with a physician before taking if you have any history of thyroid surgery and/or radiation, Hashimoto's disease, or any previous problem with your thyroid. Store in a cool, dark place. With prolonged exposure to light, the color of the tablets may change, but the potency remains the same. The suggested daily amount is 1-4 tablets/day as recommended by your physician. Work closely with your physician while on the Iodoral® program. Report to your physician any history of thyroid surgery and/or radiation, chronic lymphocytic thyroiditis (Hashimoto), and any previous problem with your thyroid. Before starting Iodoral®, your physician (He/She = He) will order blood tests for hematology, blood chemistry and thyroid functions. He will also perform an ultrasound of your thyroid to measure the size and appearance of your thyroid. Depending on the results of the thyroid function tests and ultrasound, he may order some blood tests for thyroid antibodies. If you are taking thyroid hormones, let your physician know about it. 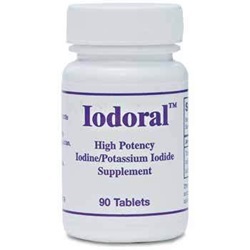 Be aware that Iodoral® enhances the response of your body to thyroid hormones. Subjects on Iodoral® feel warmer in cold environments and that is expected. However, you will need to cut down the amount of thyroid hormones if you experience palpitation, anxiety, increased sweating and intolerance to heat. That is because Iodoral® decreases your need for thyroid hormones. Your physician will guide you in titrating downward the amount of thyroid hormones. Your physician will reevaluate you one month afterward if you are on thyroid hormones, and 3 months if not. Keep a record of what you observe while on Iodoral® and show it to your physician. 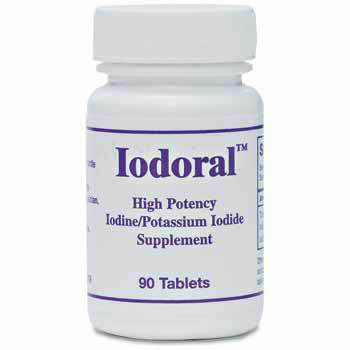 To test whole body sufficiency for iodine, 4 tablets of Iodoral® are ingested, followed by 24 hr. urine collection. The more deficient a subject is in iodine, the more iodine is retained by the body and the least excreted in the urine. Sufficiency is achieved when 90% or more of the ingested amount is excreted in the urine. In most subjects tested, 3-4 tablets of Iodoral®/day were required to achieve whole body sufficiency within 3 months and the body retained approximately 1.5 gm iodine at sufficiency. The best response in patients with FDB was observed with ingestion of 2 tablets twice a day. Check with your physician for more information about the loading test.